Your DNA Portrait As Art. 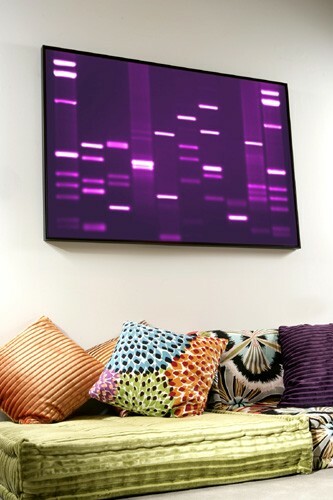 I liked this idea of using your DNA as art for your home…. I would like to have our kids DNA Portraits on my wall !….. Its a scientific form of art ! ( Yes I am calling it art! ) ….I mean I would probably be emotional every time I’ll look at the portraits ( its my kids DNA we are talking about here ! )… Isn’t that what art is supposed to do? Evoke some sort of a feeling? This is how it works, they’ll send us a collection kit with everything we need to get a sample of their DNA. They have a variety of styles, colours, sizes and frames. For more information you can click here. The Missoni for Roche Bobois seating isn’t bad either! This entry was posted in Interior Design and tagged DNA portrait, missoni cushions, missoni seating, scientific art by mia0909. Bookmark the permalink.